Driving distance from Whangarei about 34kms on sealed roads. Walking distance minimal. Lookout at car park. 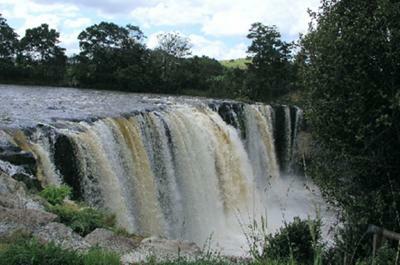 These falls are to the west of Whangerei, North Island. We visited them back in April 2006, and with beginners luck found them with a reasonable flow. I have since read that a local hydro station diverts all of the water in dry seasons. The setting is not as picturesque as other falls but they are accessible and quite impressive. To get to the falls take SH14 westwards out of Whangerei as far as Maungatapere. Turn off right onto Mangakahia Road, and follow this road through Poroti. At about 11kms from SH14 look for Wairua Falls Road on the left. Take this road to the end (about 1km).